Editor’s note: This story is reprinted from the November issue of GCU Magazine. To view the digital version, click here. 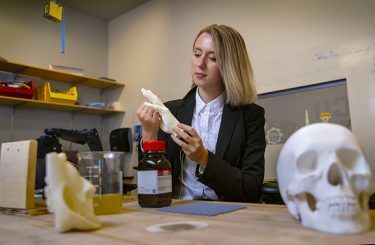 Grand Canyon University biomedical engineering junior Gabriela Calhoun wanted to do more than just deep-dive into a typical anatomy project for her undergraduate research. She wanted to move mountains. Calhoun’s biotechnology undergraduate research group found the “more” they were searching for when one of the students in the group started painting a picture of what his mother, a nurse in Rwanda, sees daily. She had told him about amputee after amputee in her care. It was a problem that resonated with the undergraduate researchers. The team learned that a small cut would lead to an infection and eventually the amputation of a finger or a hand, a foot or a leg. They wondered, could they engineer a better bandage to prevent infection? Could they save someone from losing a limb because of something as treatable as a minor cut? Could they change the course of someone’s life? “It was really important for us to find something we were all passionate about, which was when we came to wound care. The point of it was always just to help others,” said Calhoun, research team lead, of the humanitarian efforts of the 3Derma team, which developed a low-cost, 3D-printed, hydrocolloidal bandage to help in wound care in developing countries. Those humanitarian considerations – the conviction to do something more impactful in the world – is something that didn’t just happen by accident for Calhoun. On the one hand, she’s an aspiring biomedical engineer; on the other hand, she’s a Christian who wants to do good in the world. So when it came time to choosing a college, Calhoun wanted to find a university that spoke to who she is. She wanted to find a place where her faith and love of science – concepts that, so often, clash — would come together meaningfully. She found that at GCU, which intentionally integrates the Christian worldview into everything it does. It’s who GCU is, too. In 2013, GCU began a five-year initiative to more thoroughly integrate faith into its curriculum, and not just in obvious programs such as nursing, teaching or social work. The challenge was to fully integrate GCU’s Christian worldview into the hard sciences, fields of study Christian education often shies away from. Dr. Jason Hiles, Dean of the College of Theology, asked, without faith informing science, where do the answers come from when it comes to the deeper questions? 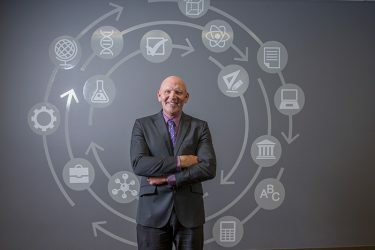 GCU’s leaders launched the initiative to purposefully integrate faith and science so it can promote the common good by strengthening the University’s mission to educate students firmly in a Christian perspective and by preparing them for careers marked by kindness, service and integrity. At GCU, that means committing itself to these convictions: that God is the creator, that fallen humans need to be redeemed and that God is restoring the world through Jesus Christ. It is through this view of the world — creation, fall, redemption and restoration — that the University approaches education. That four-fold framework is at the core of who GCU is. 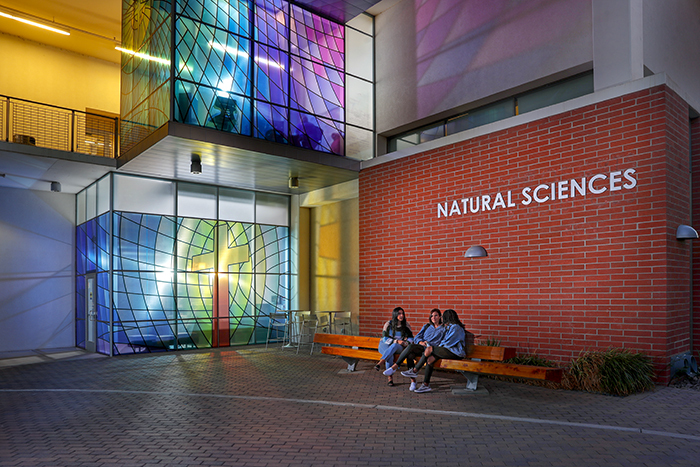 Like the rest of the University, the College of Science, Engineering and Technology (CSET) faculty connects the dots to their students’ larger life through faith-science integration. If professors are teaching a lesson about the human body, for example, they look to Scripture to find passages that might speak to human anatomy, such as the passage of the body being a temple of the Holy Spirit (1 Corinthians 6:19). They might nestle a Bible passage onto a slide related to that day’s physics lesson. Or they might question students about the ethics of a project. Biology professor Dr. Daisy Savarirajan said one of her favorite topics of discussion, when it comes to melding faith and science in her classroom, relates to microorganisms and disease containment. She will bring up the Ebola outbreak and Kaci Hickox, the Maine nurse whom doctors quarantined in 2015 after she treated victims of the virus in West Africa. That’s when Savarirajan gingerly steers the conversation toward Leviticus, the book in the Bible peppered with numerous laws about cleansing houses, examining lepers, purification after childbirth and the like. It wasn’t uncommon for a person in biblical times who might be marked with a lesion or an infection to be excommunicated — essentially the biblical version of quarantine. “That is clearly taught in the Bible — in the Old Testament — way, way back before people started even doing science. They just had no clue it was microorganisms,” said Savarirajan. Biology professor Dr. Ramesh Velupillaimani points out to his students the patterns in nature. For Velupillaimani, those patterns aren’t random. Mechanical engineering senior Christian Clifton sees firsthand how ubiquitous the Christian worldview is in his science studies. For the final project in a statistics and dynamics class, his professor assigned him to build a wind turbine. But building a wind turbine isn’t just building a wind turbine at GCU. The assignment came with this gauntlet: Only use materials you would find in a Third World country. The application of the Christian worldview into his studies is what Clifton appreciates about GCU. Another distinction about GCU, beyond faith-science integration, is how its faith efforts are united under one unifying umbrella. The University’s beliefs are outlined in its Doctrinal Statement and are filtered from the University level to the colleges and the classrooms through One Foundation. It is where all aspects of the University’s Christian mission and vision come together – the glue that unifies the University in Christian thought. It is under One Foundation, for example, that CSET brings in high-level scientists to speak about science and faith, such as a recent talk by Rice University chemist Dr. James Tour, who touched on his groundbreaking nanotechnology research as well as how important the Scriptures are in his life. 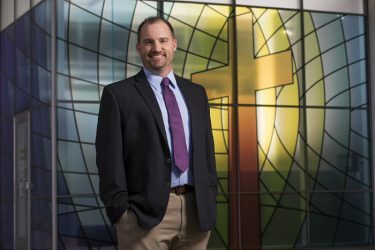 When it comes to faith and science, there’s a strong temptation, Hiles said, to pull back from the Christian faith rather than move toward it like GCU does. Without faith informing science, Hiles said, where do the answers come from when it comes to the deeper questions: What are we doing with what we know? Should we modify genes? Should we alter human beings? 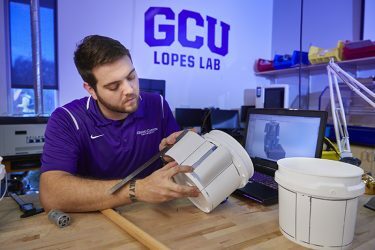 Dr. Mark Wooden, Dean of the College of Science, Engineering and Technology, said GCU shows students how faith and science can work together. CSET Dean Dr. Mark Wooden also doesn’t see a clash between the two. He references the Book of Genesis, where it is written that God gave humans dominion over the world, and he cites passages in Job that say the way to understand God’s creation is through investigation. Faith and science have worked together well in Wooden’s life. The CSET dean spent most of his career teaching at secular universities before finding his place — his passion — at GCU. “I came out of a strongly evolutionary biology Ph.D. program. I worked with many evolutionary biologists — they were all atheists. There wasn’t a single person I knew of that I could speak with (about the Christian faith) in that environment,” he said. That’s not the case at GCU. He also loves GCU’s inclusiveness – a conviction that resonates with a large segment of the campus community. “I’m coming from a Christian worldview, but I want anyone who’s not to feel just as comfortable. When you can integrate Jesus into the classroom, it makes for a more inclusive atmosphere,” said Jones. Not that inclusiveness means putting aside the University’s Christian worldview, which is an absolute. GCU’s commitment to the Christian worldview is important to parents who choose to send their children to study here, particularly in the sciences, Savarirajan said. According to Campus Renewal, roughly 70 percent of Christian teens nationwide lose their faith during their first year in college. At GCU, the opposite of that Campus Renewal data is occurring. University-wide faith integration surveys indicate almost 85 percent of traditional campus students have a positive perception of faith integration and almost 87 percent of online students have a positive one. Moreover, nearly 75 percent of all students said their faith has grown while at GCU. It helps, Hiles added, when GCU’s professors live out the Christian faith. “In this culture, people put a lot of weight on scientific information more than they do on any other type of data,” Hiles said. “So if a scientist says it, we feel like it must be true. If a scientist coming from a non-Christian perspective says all of the science proves something about God not existing or the universe not coming from a creator, it rattles them (students). They don’t know what to do. That integration of faith and science has impacted Gabriela Calhoun profoundly. Calhoun was an agnostic, she said, until her junior year in high school, when her mom found a church she loved. GCU is helping her move mountains – through faith and science.